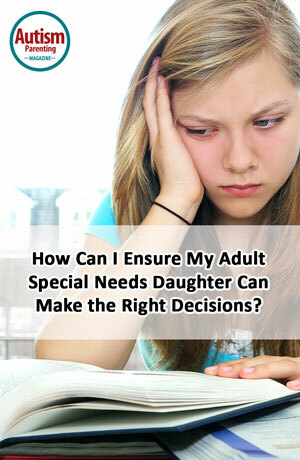 How Can I Ensure My Adult Special Needs Daughter Can Make the Right Decisions? Ann, Thank you for your question. Turning 18 years old is a significant milestone in most young people’s lives, but for individuals with special needs it is critical. When we think about your daughter turning 18, we think of two major areas of her life that you will need to consider. The first area is her ability to make her own decisions and understand the consequences of making those decisions. If your daughter still needs help in making sound decisions such as financial decisions, medical decisions, educational decisions and day to day life decisions, then you may want to consider applying to be her Guardian. Being your daughter’s Guardian allows you to continue to be in the parental role. You not only help her make decisions, you continue to be the final decision maker. In order to become your daughter’s Guardian you will need to begin the Guardianship process. You can begin this process by contacting your Clerk of Courts office in the county in which you live. They will have paperwork that you will need to complete, and they will walk you through the necessary steps. The second area that needs to be addressed is your daughter qualifying for government benefits. Depending on her diagnosis, and the level of need, she may very well qualify to receive benefits such as Medicaid and Supplemental Security Income (SSI). Medicaid will provide health care but more importantly will provide access to services such as Housing, Supportive Employment, Transportation, and more; while SSI will provide your daughter a monthly income. In order to qualify for these items you must contact your local social security office and apply. You will need documentation that illustrates your daughter’s disability, as well as documentation that shows her financial situation. Please note that in order to qualify for Medicaid and SSI, your daughter not only must qualify based upon her diagnosis, but also financially. It is important that your daughter does not have countable assets in her name that exceed $2,000. Most assets will count towards that $2,000 amount. If your daughter has a savings account, a custodial investment account (UTMA), checking account, savings bonds (and the list continues) that total more than $2,000 she will not qualify for Medicaid and SSI. Please take solace in knowing that all is not lost if her accounts total more than $2,000. There are steps you can take to still qualify! Your daughter’s 18th birthday brings joy, and also brings important decisions for you, her and your family. If you are unsure of the direction that is best for your daughter and your family, please feel free to contact us or visit our website for more information. This is impossible to answer! In the US 18 is the age for self-determination, while services continue through to 21… in actuality, self-direction should be supported from the very beginning. In addition to legal and medical input, I strongly urge parents/guardians and individuals to check out the local self advocacy group. It is important for adult children with special needs to have as much independence as possible within reason, for as long as possible. This allows them to at least attempt and even sometimes succeed at a quality life with some limitations. Eventually, however– there will come a moment where parents have to realize it is not safe or possible for the adult with disabilities to make decisions accurately. In this case, the family of birth should have a family conference and look at all the options and progress on the path of these options to the eventual final place of guardianship. In Alberta, Canada we have a personal directive that allows the adult to choose people who will become her agents once it has been determined that she no longer has capacity. The personal directive allows family to become agents which is like guardianship but not as safe a role in my opinion. Capacity assessment done by two assessors determines capacity; a trigger is usually required usually a medical decision. I’m not sure that being an agent for an adult with problems is good enough to keep that adult safe from external bodies that may not work in the best interests of that handicapped adult. I mean these public bodies have their own agenda for doing their decisions and these agenda may not ensure safety or accurate placement decisions are made for the handicapped person. In my handicapped sister’s case, the people at AHS and Covenant Health were consulting with the Public Guardian of Alberta with reference to the Public Guardian taking over the guardianship of the adult so as to “facilitate discharge” from hospital. This sort of usurpation of role of the birth family and extended family is not acceptable when the adult with handicaps has a supportive family. So why is it happening? It is happening for bureaucratic expediency. The adult child with handicaps is managed in the most expedient manner by government and public bodies. My advice is when the time comes, obtain guardianship and look after your adult child with the help of other adult children. Parents are not here forever. Either make one of the other adult siblings the guardian or have two guardians -a parent and a sibling so that there is always someone in the picture. Our vulnerable children and adults are not of interest to government or really anyone else. Families are the ones who care the most about our handicapped kids. We have to be there for them. They cannot speak or advocate for themselves. Understand the limitations of the current society that is not family friendly-especially to the families of handicapped children or adults. Our kids are handicapped with their own health issues and then are handicapped by a society that sees them in a lower value way that stigmatizes them further. The handicapped folks in our society not only carry the stigma of their afflictions but also carry the weight of public ignorance and the burden of “costing” the system more. To be told that your child or adult with handicaps is being serviced for X number of times, for X dollars and that with all the problems of said individual –the underlying implication is why bother to keep saving the afflicted one? You won’t understand all of this until you go through it. The change in the resuscitation status for my handicapped sister from R1 (full resuscitation) to R3 (no intubation) to M3 and then back to R1 was an eye popping revelation of the failures of the health care system with respect to our most vulnerable citizens. How can all this stuff happen? No one knows. No one talks. No one is able to explain it to the public. No handicapped citizen should be able to go from full resuscitation status to no intubation without full investigation and review of the case -and not just by a handy dandy external medical consultant but by all concerned. Then there should be an ability by family to appeal such major decisions. It is unacceptable that such status designations or shifts can happen without proper background investigation. But again, how will you know? You will only know upon doing the investigation yourself as a family. Make sure you have guardianship. Make sure you have enough funds set aside for your adult with handicaps. Make sure you have trusted people to be there for your adult with handicaps after you are gone. Our handicapped family members need all the supporters they can get. This society is unable to first visualize a new way –must less bring it into being. I’m very disturbed that this answer suggests guardianship without any mention of possible alternatives. Guardianship is a drastic choice that essentially means your daughter is not legally considered entitled to make any decisions about her own life. Not regarding her money, her living situation, her friends or romantic relationships, or her health care. ASAN has a new toolkit out about supported decision-making agreements as an alternative to guardianship. You should be able to search their website for it. But many autistic people don’t need any kind of formal supported decision-making situation, let alone guardianship, at all. Particularly if we have HAD chances all our lives to practice good decision-making, been allowed to learn from the consequences of our actions, and have good relationships with friends and family we can go to for support and advice. Long story short, you CAN’T ensure that your daughter will make the right decisions, because you can’t ensure that for ANY young adult child. Your daughter should have the right to make mistakes and learn from experience just like a non-disabled young adult is presumed to have that right. Being autistic or disabled should not automatically mean losing our rights of self-determination and decision-making when we turn 18.